Looking for HDMI Products? Here at Amamax, we have a wide selection of HDMI cables and products. HDMI is short for High Definition Multimedia Interface. 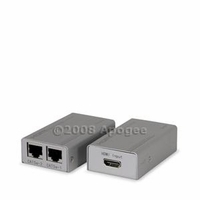 HDMI is a compact audio or video interface for transmitting uncompressed digital data. HDMI can be used to connect digital video/audio sources like computers, gaming consoles, AV receivers, Blu-ray Disk players, and setup boxes to digital audio devices and monitors/ digital television. Our HDMI Products include all the following: AV Adapters, HDMI Cables, HDMI DVI Cables, HDMI Switchers, HDMI Converters, HDMI Splitters, HDMI Extenders, HDMI AV Extenders and wall plates. Experience your high definition multimedia product today!